A quick and easy low-fat family supper dish, using our new extra-large shell-shaped pasta, roasted sweet cherry tomatoes, garlic and crème fraîche. Preheat the oven to 180°C, gas mark 4. Place the cherry tomatoes, olive oil, garlic and seasoning in a medium shallow ovenproof dish and mix well to coat everything in the oil. Bake for 30 minutes, stirring once during cooking, until the tomatoes are soft but still holding their shape. Fifteen minutes before the tomatoes are ready, cook the pasta according to pack instructions, then drain thoroughly. 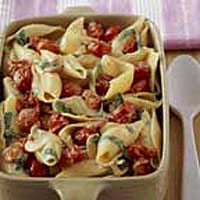 Tip the cooked pasta into a large serving dish. Add the crème fraîche and the roasted tomatoes and toss everything together. Season to taste. Roughly shred the basil by rolling the leaves up together in small cigar-shaped bundles, then slicing very thinly. Stir into the pasta and serve immediately, with a fresh watercress salad and some ciabatta bread. Seasoning the tomatoes before they start cooking draws out more moisture, which concentrates their flavour, giving a tastier result. This recipe was first published in Tue Feb 01 00:00:00 GMT 2005.